The Ethics in Science and Engineering National Clearinghouse (ESENCe) beta site was one of two sites funded in 2009 by the National Science Foundation to respond to ethics requirements in the America COMPETES Act. The permanent online resource site will be hosted at the University of Illinois beginning Fall 2010. 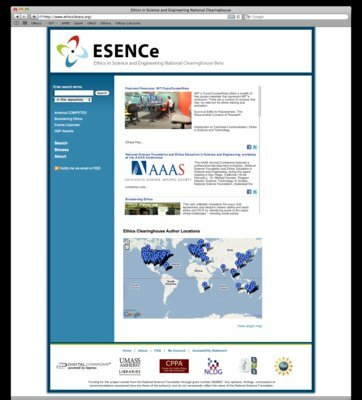 Materials compiled by ESENCe from 2009 to 2010 are available through ScholarWorks at UMass. 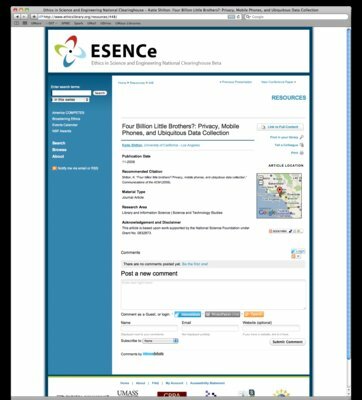 The Ethics in Science and Engineering National Clearinghouse (ESENCe) beta site was a digital repository of materials on ethics and the responsible and ethical conduct of research in science and engineering, including the social sciences. It was developed in response to the America Creating Opportunities to Meaningfully Promote Excellence in Technology, Education, and Science (COMPETES) Act, which requires that proposals to the National Science Foundation (NSF) have "a plan to provide appropriate training and oversight in the responsible and ethical conduct of research to undergraduate students, graduate students, and postdoctoral researchers participating in the proposed research project" (Sec 7009). It further requires that proposals "describe in detail the mentoring activities that will be provided for [postdoctoral researchers]" (Sec 7008). While NSF has always encouraged ethical conduct of research, the America COMPETES Act makes this requirement explicit and creates an opportunity to better compile and disseminate ethics research results and related education materials. Current repositories, clearinghouses, and websites that house ethics materials generally focus on one disciplinary field. The University of Massachusetts Amherst beta site was designed to examine effective ways to coordinate and present materials from across disciplines, including the social sciences, and acts as a portal to direct faculty, post-doctoral, and graduate researchers to a wide range of ethics resources. The library also provided resources necessary to examine the advantages and disadvantages of using stand alone, off-the-shelf, online training packages and programs for teaching ethics. While these programs and materials can be efficient methods of teaching ethics, many experts question their effectiveness (See Kalichman 2005; NAE 2009; Schrag 2005; Sieber 2005; Smith-Doer, Journal of Empirical Research in Human Research, 2009, and others). The beta library was a resource for institutions as they decided how to ensure appropriate ethics training for researchers.